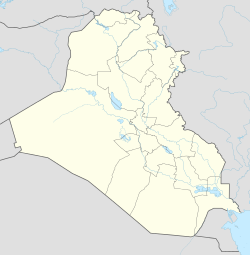 Khanaqin (Arabic: خانقين; Kurdish: Xaneqîn خانه‌قین) is a city in Iraq in Iraq's Diyala Governorate, near the Iranian border on the Alwand tributary of the Diyala River. It is the administrative center of the Khanaqin District, which comprises several towns (such as As-Sadiyah and Jalula) as well as hundreds of villages. The city is divided into two parts by the Alwand, which has played a significant role in land cultivation and the establishment of a strong rural society in the area. The majority of the town's inhabitants are Shia Kalhor Kurds. A sizable number of Turkmen live in the town. Small amounts of Shia Arabs are still left over from the Arabization policy of the Ba'athist regime; Khanaqin was subject to the Arabization policy of Ba'athist Iraq, but this has been substantially reversed since the 2003 Invasion of Iraq. Khanaqin has a hot semi-arid climate (Köppen climate classification BSh). The Naft Khana oil field is capable of producing up to 16,000 barrels per day (2,500 m3/d) of sweet light crude from an oil reserve that is also being tapped by Iran in Naft Shahr. Repairs to the oil plant were completed in March 2006 which restored it to its pre-war condition. The main elements affected were the gas-oil separation facility and the wet crude facility (which separates oil from water). Trucks currently transport oil to the Al Daura refinery in Baghdad. A 20,000-barrel-per-day (3,200 m3/d) oil refinery has been approved for construction in Khanaqin and oil from Naft Khana will be sent there when it is complete. During the 1970s the intensive Arabization and deportation policy of the Iraqi regime led Arabs to settle in this oil-rich city. Due to this policy, all Kurdish refinery workers and, at that time and place, their only Kurdish Engineer (Mr. Sheik Kader Sheik Rahem Talabani) were deported to the West of Iraq. Leyla Qasim, among the first female peshmerga murdered by Baath regime. ^ "IRAQ City & Town Population Geography Population Map cities coordinates location". Tageo.com. 6 Feb 2011. Retrieved 6 Feb 2009. ^ کرد و پراکندگی او در گستره ایران زمین - ح. بهتویی - ۱۳۷۷ - تهران. ^ Rüdiger Schmitt: Die iranischen Sprachen in Gegenwart und Geschichte. Wiesbaden (Reichert) 2000,. ^ "Khanaqin, once known as 'city of tolerance,' still open to Arab refugees". ^ "Weatherbase: Historical Weather for Khanaqin, Iraq". Weatherbase. 2011. Retrieved on November 24, 2011. This page was last edited on 16 January 2019, at 14:16 (UTC).